An AFCI breaker, known as an Arc Fault Circuit Interrupter, is important because the part is able to cut power when it detects an “arc fault,” something a standard breaker is unable to do, essentially protecting you from an electrical fire. In a standard breaker, the electric current will run safely along the wiring enclosed within the insulation of your home, and as long as everything is working as it should, the insulation will act similar to that of a jack, keeping the electrical current contained and on track to allow to it travel as it should. However, if your insulation becomes damaged for whatever reason, then the current can escape this “jacket,” a term referred to as arching in the electrical world. Once this arc is created, the temperatures can exceed 10,000°F, making it the perfect condition for an electrical fire. Aside from damaged insulation, an arc fault can also be caused by faulty appliances, loose/damaged wires and/or overloaded outlets. The costs of an AFCI breaker will depend on a few factors, including the professional you choose, the type of breaker purchased and the geographical region you live in. For just the AFCI breaker part, without any professional installation factored in, the costs can range anywhere from $25 to $45, but if you were to need a professional electrician to install one, then the costs, depending on the scope of the job could increase to as much as $165 to $290 for a straightforward install or replacement. If any complications were to arise, such as an outdated fuse box and/or the wiring needs to be re-routed, then the prices could increase based on the scope of the job. For a simple install, a good electrician can often install four of them in less than two hours. As most jobs are fairly straightforward, some jobs may need more work than others, effectively increasing the costs of your quote, and for that reason, you may want to gather a few quotes from contractors in your area to ensure you’re not paying too much. If you do not know where to start or simply do not have the time, we highly recommend the free quote comparison tool, HomeAdvisor.com. It’s free and very easy to start using. Simply explain your job, and with that information, contractors will contact you, sometimes within minutes or hours, with a quote ballpark on your job. Plumbline Services, a professional HVAC provider in the Denver, Colorado area, noted you should be prepared to spend $160 to $260 per breaker, but there are two factors which affect the cost: the quality of the electrician you hire and the difficulties your electrician may come across such as re-running wires, adding an AFCI-protected circuit to an outdated box and/or the existing electronics were poorly installed. Do I need a new AFCI breaker inside of my home? 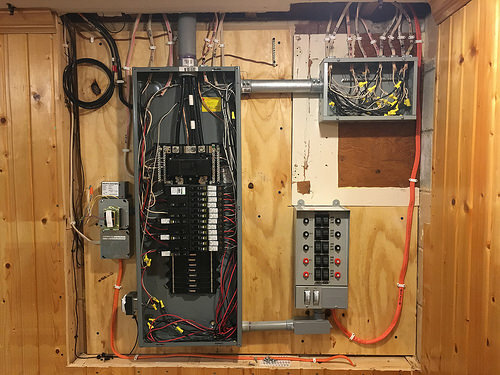 The National Electric Code states you are not required (but it’s highly suggested) to replace a standard breaker with an AFCI breaker if your home was built before 2002; however, all homes built today and if you’re completely replacing a new circuit, then the code does require a new AFCI breaker. Most electricians, however, recommend replacing when you’re upgrading the main electrical panel, you plan on selling your home, you’re renovating and/or you just want a peace of mind from an electrical fire occurring in the future.